NASA astronaut Nick Hague verifies his U.S. spacesuit is sized correctly and fits properly ahead of a set of upcoming spacewalks. Expedition 59 Flight Engineers Nick Hague and Anne McClain of NASA will begin a spacewalk outside of the International Space Station at about 8 a.m. EDT Friday, March 22. NASA Television coverage of the spacewalk will begin at 6:30 a.m. This will be the 214th spacewalk in support of space station assembly and maintenance. McClain will be designated extravehicular crewmember 1 (EV 1), wearing the suit with red stripes. 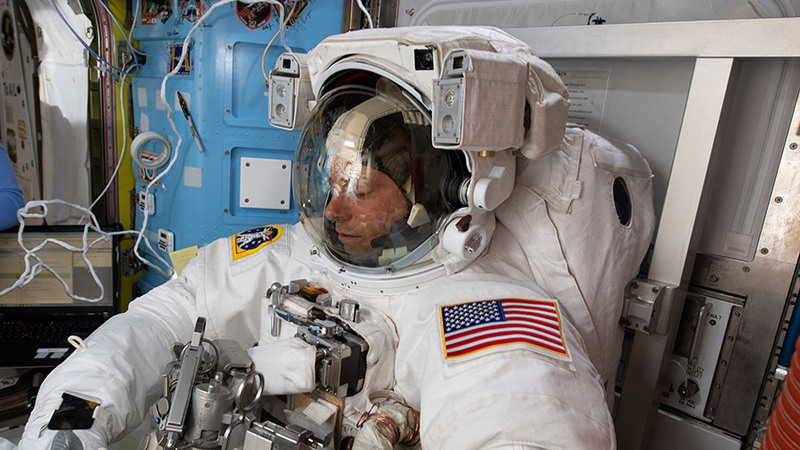 Hague will be designated extravehicular crew member 2 (EV 2), wearing the suit with no stripes. This is the first of two battery replacement spacewalks this month. McClain and Hague will replace nickel-hydrogen batteries with newer, more powerful lithium-ion batteries for the power channel on one pair of the station’s solar arrays. The batteries were transported to the station in September aboard the Japanese H-II Transfer Vehicle. The spacewalking work continues the overall upgrade of the station’s power system that began with similar battery replacement during spacewalks in January 2017. Follow @space_station on Twitter for updates online. For more information about the International Space Station, visit www.nasa.gov/station. I want to become an astronomer or an astronaut but how can i do it? I live in the Philippines. Is it possible? !